We had a great sail – the perfect wind for Blue Mistress, a crew of four, and a sunny day. Ross had noticed the lifted plate – I had missed it. I wasn’t looking. I trusted the fitting. And that could have been a big mistake. The inevitable questions: Was water getting in? Was the block beneath rotten? 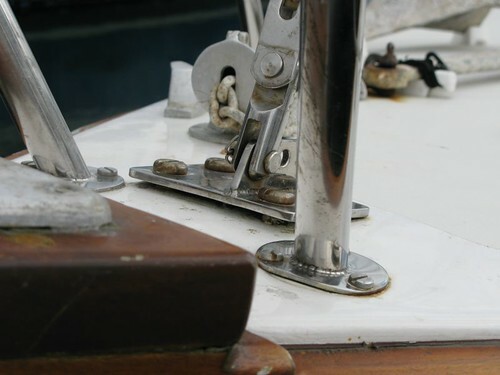 The bolts were obviously pulling through, would the forestay pull out of the deck? If so, would the mast go overboard? . . . Or onto the crew in the cockpit? Yes, well . . . questions like that come up when you are taken by surprise . . . before standing back and sizing up the situation properly. I had previously thought the forestay to be tight but it carried the hanked-on genoa well. Now I saw it as bar-taut and straining my mast. The mast bend suddenly seemed excessive. 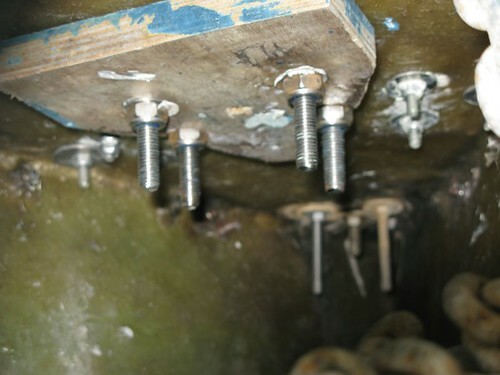 Inspection in the chain-locker showed the forward bolts angled forward. There would have been less of a problem if it had been cut with a little more care so that there was no overlap of the washers at the edge. It would have been even better if more time had been spent and it had been carefully shaped and fitted. It’s one of those ‘out of sight, out of mind’ jobs. I have been writing about skilled craftsmanship for years now – I hold up my hands, I thought I had cleared up most of the problems on my own boat. It wasn’t just the ply, of course, but the over-tight rigging that pushed it over its limit. Problems rarely come singly. They are part of a series – one thing leading to another leading to another leading to disaster. 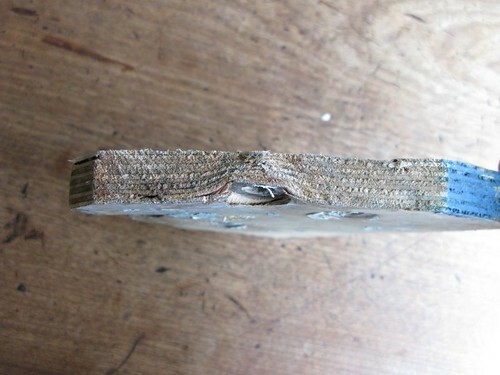 How much strain is required to achieve this degree of distortion in a piece of marine ply? In the event, there was no sign of water entering. Nor was there any sign of rot. And it probably wouldn’t have pulled through. But that’s no consolation. We have replaced the offcut with a stainless steel plate, cut to size, sandwiching a wooden block, cut to the same size, for compression. (Thanks, Richard). The rigging has been re-set with less tension on the shrouds and a more gentle mastbend. Now I’m going through the boat with a fine tooth-comb. Once bitten . . . . .
← For love of a boat – one year on. How guilty I feel. I moved the fore stay forward a bit to improve the balance of the boat. 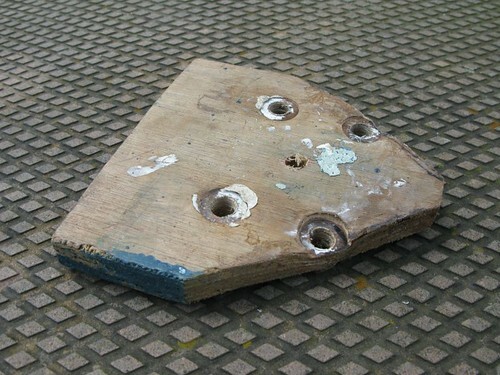 I did find that excellent piece Of marine ply in the skip and thought what a waste, that’ll just fit, which it did….just. Oh what a bodger I am and now I’m shamed.